Plump January greenheads poured from the sky in swarms unlike any I had seen in 20 years of waterfowling. Big groups, small groups, pairs, singles; all with an insatiable appetite for the marsh grasses surrounding the narrow, unassuming Pennsylvania creek. We had shot about half our limit when I simply set my gun down to soak it all in. In total awe, I looked to my left and saw two others in the group quietly doing the same. We ended our day with 20 gorgeous mallards and six geese, an unlikely sum in our region. Even more surprising in this day and age, our banner hunt wasn't achieved through a guide service or lease. We had hunted private land — for free — thanks only to a knock on a farmer's door and a handshake. Sure, it seems next to impossible in these times of high-dollar leases and "NO HUNTING" signs. That's what I thought, too, until about a year ago, when I was invited to hunt with several Penn State students who are among the most impressive, dedicated bunch of waterfowlers I've met. Simply by introducing themselves to landowners and being polite, they've gained access to enough private land to make any mallard hunter green with envy. Here's what we can learn from these young men about scouting, dedication and good old fashioned schmoozing. When childhood friends Tyler Coleman, Nick Barry, Jacob Kraybill, Mike Simpson, Eric Klopp and Ben Arnold first arrived in State College, Pa., they had two goals: Find an apartment large enough for their guns, gear and the trappings of college life, and start scouting ducks. "We sort of got after it that first semester, that's how we scout," says Barry, as we sipped cold Yuengling Lagers on a pair of futons in their apartment. It was a pretty typical college pad, save the duck mounts lining the walls, which include a mallard, wigeon and oldsquaw. A neck-banded snow goose stood on a coffee table. "If you put the time in, we feel like you can find ducks just about anywhere in the country." There's nothing fancy about the tactics employed by the young men: They print out a Google map, circle all the water on it, and drive their tails off checking each location. "We put 1,000 miles on my truck in one semester and never traveled more than 25 miles from town," Barry recalls. "Another time we put what little money we had into Tyler's tank. It was supposed to be our 'scouting gas' for the next few weeks. We burned it in one day, barely made it home." "It may sound like a pain, but to me it's part of the fun," says Coleman. "You never know what you're going to see, and there's nothing better than finding ducks, setting up on them in the morning and having it all come together." There's no real secret to this strategy — it's about covering as much ground as possible — which doesn't come without sacrifices, like going to bed at 6 p.m. and waking up early to do homework before heading out. "Guys would show up at our apartment to drink beer and we would all be asleep," said Coleman. "From September to February, if we aren't hunting, we're scouting. Our girlfriends are always on the brink of dumping us." In addition to the students' hands-on reconnaissance missions, they ask fellow hunters on campus what they're seeing. Obviously, most hunters are tight-lipped. An unlikely ally helped the boys out. "We've made friends with the birdwatchers," Coleman says with a chuckle. "They have a club on campus, and they'll tell you flat out what they're seeing." In November a birder divulged he had seen a few brant on a large pond near town. Coleman received permission to hunt it, and to this day he's the only hunter I know who's shot a brant in central Pennsylvania. "I posted the photo to my Facebook page, and the birder 'liked' it," Coleman says. "You'd think birders would care that we shoot the birds, but we've stressed our passion for conservation — they really relate to that. I definitely wouldn't hesitate to introduce yourself to a birder or two. You'd be surprised how much you may learn." So, you ran your truck into the ground and found a pile of ducks on a sweet-looking marshy field, but to your chagrin it is posted — now what? 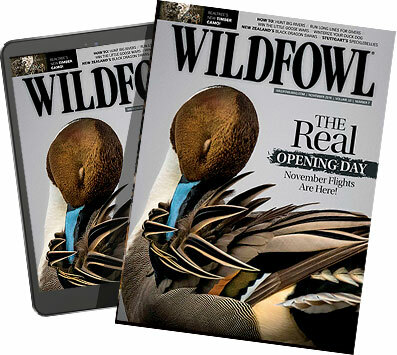 Many waterfowlers throw up their hands, grumble that the days of knocking on doors are long gone, and drive off. I've certainly done so. My new student friends (a phrase that terrifies my wife) prove that the good old days are truly alive and well. "We've knocked on doors and shot mallards the next day," says Klopp. "I'd say we only get turned down about 60 percent of the time, and we talk to a lot of landowners." Granted, these guys are not talking about a prime flooded timber hole in Arkansas or a Missouri peanut field. In areas loaded with guides and outfitters where duck property is a major cash cow, manners only go so far. But across 80 percent of the U.S., country-boy charm can still go a long way. "Heck, I'd say it's more like we get permission 60 percent of the time," Coleman interjected. "And actually this season I don't recall getting turned away a single time. We have about 15 private properties to choose from scattered across the state." The kids are likable and have a knack for developing a quick rapport with landowners. However, I believe their biggest strength is their total lack of fear in approaching strangers' homes. Why are so many of us apprehensive about it? Is it the possibility we'll anger the farmer or suffer the embarrassment of rejection? "We just don't care about that," Coleman says. "It's not like the farmer is going to chase you off the property with a shotgun. The worst that will happen is he'll say no. If we see ducks, we chat with the farmer, even if we've heard the land is leased or spoken for by other hunters — often that turns out to be bunk." "Well there was that one time we turned around," Klopp says. "Oh, right. There were two dead cats in the driveway. We took that as a bad sign." Once you've found ducks and knocked on the door, you've cleared two major hurdles. Next, just be yourself. "If you're polite, you're an ethical hunter and a true believer in conservation, you have such an advantage talking to farmers," says Coleman. "They know a genuine person when they meet one. Just tell them what you're about, and remember sir and ma'am still go a long way these days." The mallard hole that opened this story is a perfect example of the boys' access strategy in action. "We actually know of a few people who were turned away multiple times from hunting there," says Barry. "I think they were too forward. When we first knocked on the farmer's door, we didn't even mention hunting. We just introduced ourselves, extended a firm handshake and showed him that we were respectful. I told him about my family's farm and he told me about his. Then after he got to know us a little we casually mentioned we had seen a few ducks on the creek." But the birds were located near the farmer's barn and silos. He wasn't so sure it was a good idea to allow hunters. "We told him we recognized those safety concerns and that they were our first priority," says Barry. "I really think that attitude is what got us permission. It also didn't hurt that we explained we would only hunt the spot once per week to rest the ducks. The landowner respected our restraint, and he knew he wouldn't have to hear shots every morning." Through a little care, common sense and strong people skills, the young men secured arguably as good a mallard hole as can be found in the Atlantic Flyway — lease or no lease. However, things don't always go as planned. "Our first year in State College, we received permission to hunt this great pond for opening day where we had seen tons of mallards and wood ducks," Barry recalls. "We were all excited, of course, but as we pulled in other hunters were already setting up. We both claimed we had permission to hunt. And it was just about to get heated, but they had kids with them so we let them do their thing." As it turns out, the person who gave the students permission to hunt, unbeknownst to them, merely rented the building on the property. They had no leg to stand on. "But the other hunters really appreciated that we didn't cause a scene in front of their kids, so they said, 'Hey, why don't you hunt the small pond on the other end of the property?'" Barry says. "We shot three ducks while they shot limits, but afterward they gave us the real landowner's contact info. Can you imagine helping someone else get permission to hunt your spot? They were that impressed, I guess." The students hunted the property on the first day of the second split. They shot 15 mallards and three wood ducks, and were back on campus in time for 8 a.m. classes. "Some people will definitely turn you down," says Klopp. "But we always go back next year and ask again, unless they ask us not to. There's luck involved here. Maybe this time you'll catch them in a good mood and get access." "And always remember to thank the landowner for the opportunity to chat, even if you're turned away," Barry says. "I agree, that's huge," Kraybill says. "If they remember how respectful you were last year, they may give you a chance. We certainly don't always get permission the first try." It also doesn't hurt if your hunting group has at least one individual who thinks quickly on his feet. One day Kraybill and Barry were on a scouting mission and saw a pile of ducks drop over a ridge. They knocked on the farmer's door, but were informed other hunters already had permission. So Barry proffered that he and Kraybill hunt the property just one day per season, provided they give the landowner advanced notice. He agreed. Two weeks later they shot three drake mallards and hustled to campus. Then there was the time Coleman was told by a farmer that "only family" was allowed to hunt his land. Coleman suspected the farmer had merely jumpshot waterfowl, so he offered to let the man experience the thrill of shooting over his decoys. "I don't know if he appreciated the gesture or what, but all of a sudden he offered to let me hunt," Coleman says. After our big mallard shoot, I accompanied the students to the farmhouse to thank the owner for the opportunity. He seemed genuinely happy his land had provided such good fortune. "Thanking the landowner when you see him is a no-brainer, but little gestures before and after the season go such a long way, too," Barry says. "Every spring I send each landowner a gift and a handwritten letter expressing how much we appreciate the chance to hunt and get a break from our schoolwork. We offer to lend a hand on the properties, build wood duck boxes, anything we can to return the favor. And we visit occasionally, certainly at least once or twice before the season. We never just show up on opening day expecting to still have permission." Quite a grown-up attitude for a college senior. When I met Barry and his buddies, and hunted a few of their honey holes, I was determined to discover their secret. How is it possible they moved to town and secured more private land hotspots than most lifelong residents (including myself)? Pretty simple actually: They scout harder, knock on more doors and have more fun doing it. Well, maybe there is one secret: "We like people," Coleman says. "And we make sure they know it."